An artist’s impression of Remarkable Lodge. 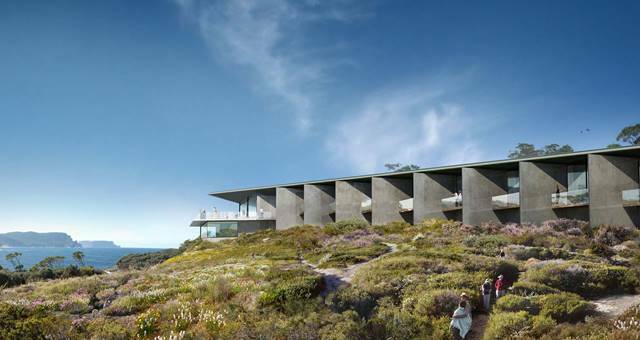 Baillie Lodges has announced its long-held plans to create a luxury wilderness retreat on Tasmania’s rugged southeast coast will go ahead. The $20m Remarkable Lodge, which adjoins the Tasman National Park, will be the fourth property in the Baillie Lodges swag of Australian luxury lodges upon its completion in 2020. Work has already begun to fine tune the lodge’s design and guest experience concepts and will continue throughout 2018. Owner James Baillie said the philosophy behind the Baillie Lodges guest experience was to create a real sense of place in each of the destinations in which they operated. “After many years in the planning, Hayley and I are very excited to be adding the remarkable Tasman Peninsula to our collection of unique wilderness destinations around Australia,” Mr Baillie said. “We see a fabulous opportunity to harness Tasmania’s already thriving food and beverage offering including fine wines, island beers, small-batch whiskies and gins, as well as fabulous produce including cheeses, oysters, seafood and beef. “We believe Remarkable Lodge will provide a welcome boost to the local and regional economies. Not only will it create new, sustainable tourism jobs directly related to the lodge, but support industries including local tour operators, food and beverage producers, building suppliers and tradesmen, interior designers and local artists are also set to benefit. Onsite, guests will be able to enjoy a restaurant and bar, open fire and expansive terrace, a bunker-style retreat with dedicated spa and an indoor-outdoor swimming pool. Construction is expected to commence in 2019, with Remarkable Lodge flagged to open in 2020.